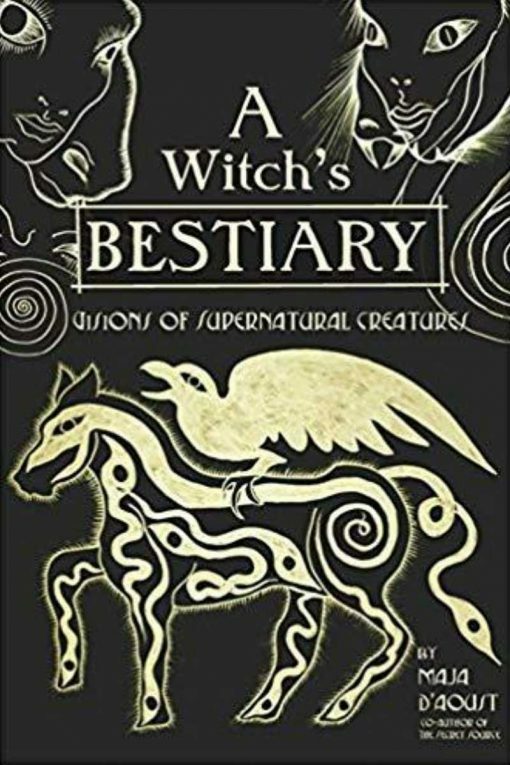 A Witch’s Bestiary delves through ancient mythological records and esoteric occult sources to encounter and catalog the residents of the unknown. It takes the reader on a journey through the most fantastical tales of animals previously known to only a precious few. These supernatural beasts are strange reflections of the true nature of humanity and deserve intense study, lest we forget our primitive origins and the animals that live in us all. This Chthonic adventure digs through both subconscious and conscious awareness, guiding us through suppressed instinctual emotions and feelings. The lessons of the animals from these ancient stories deepen our engagement with the earth, nature, and the living beings of our planet. A keen knowledge of these tales provides a weapon against missteps in our modern-day lives. Once you better acquaint yourself with these strangely familiar mythological beasts, you will understand how aspects of these beasts manifest in ourselves and other. Maja D’Aoust is a scholar of alchemy and occult lore whose interest in the esoteric occult sciences spans her entire lifetime. After completing her Bachelor’s Degree in Biochemistry, Maja studied Oriental Medicine and acupuncture and later earned her Master’s degree in Transformational Psychology with a focus on Shamanism, the I Ching and ancestors in her Thesis work. Maja is the co-author of the book The Secret Source with Adam Parfrey and was the co-host of the radio show “Expanding Mind” with Erik Davis. Maja has published a Tarot deck called “The White Witch Tarot” though Red Feather Press. Maja lectures on mysterious topics in Los Angeles and educates the public community through her non-profit, The Well Wishers, which she established with Dr. Kelvin DeWolfe.